Last week was the week of the "A" ships. As a report circulated that P&O is about to sell the Artemis to Phoenix Reisen, Transocean Tours, who operate the Astor, went into admininstration, and news broke that Arcalia Shipping's Athena will be chartered by Page & Moy next year to replace the Ocean Majesty. Meanwhile, Phoenix's Amadea, which the Artemis would join, has now settled in as a long-distance cruiser. So let's have a look at some of these highly individual ships and their roles in today's market. The French publication "Mer et Marine" last week carried a shipbroker's report that discussions were taking place that might see P&O's 1,200-berth Artemis sold to Phoenix Resien of Bonn to operate alongside their Amadea and Albatros. Not confirmed, but not denied by P&O, she would not be available until completion of her 2011 Grand Voyage to the Far East that April. The Artemis, built as Princess Cruises' Royal Princess, was ahead of its time, introducing multiple balconies in a new cruise ship design. Completed by Wartsila in Finland and christened in November 1984 by Princess Diana, Princess of Wales, she would be the only ship built to the design, as Princess acquired three new orders from Sitmar Cruises when it acquired that line in 1988. There was some controversy though when Crystal Cruises, also Los Angeles-based, commissioned their Crystal Harmony, a ship that in many ways resembled the Royal Princess in its layout, and reportedly a payment was made by Kawasaki, who built the Crystal Harmony, to Wartsila. Moved into the P&O Cruises fleet in May 2005, the Royal Princess became the adults-only Artemis, cunningly renamed after the Greek goddess of the hunt, which in Rome of course was Diana. If she does go to Phoenix, and that would not be surprising with the delivery of the new 3,100-berth Azura (another "A" ship) to P&O and the 2,092-berth Queen Elizabeth to sister line Cunard next year, her name might fit in quite well with their own fleet. Last week news also broke that Transocean Tours, which by next year will have been reduced from three ocean ships to just one, the 590-berth Astor, (plus five river cruisers), had entered administration. The balance of the scheduled 2010 cruises will be performed while Transocean negotiate a possible new joint venture with Premicon, who own the Astor. Premicon controls twenty-two river cruise ships (five of which also operate for Viking River Cruises), two container ships and has a 30% share in ten small container ships operated by German shipowner BBC Bremen plus one bulk carrier, as well as other interests. A scheduled refit for the Astor that was scheduled for spring 2010 will go ahead while the new arrangements are made by the same Bremen lawyer, Edgar Groenda, who is handling the Deilmann administration. It is said that Transocean's problems stem from a combination of the present economic crisis, late payments arising from the cancellation of the 500-berth Astoria's 2008-09 world cruise due to engine problems (she was owned by the troubled Club Cruise) and the pronounced fall in Sterling, which badly affected earnings from the UK operations of the 848-berth Marco Polo. Now, the Astoria and Marco Polo are both going to the UK market, the Astoria purchased by Saga to become their Saga Pearl II, replacing the Saga Rose, and the Marco Polo on five-year charter from her Greek owners to Cruise & Maritime Voyages. The Astor and Astoria were built in Germany in the early 1980s with an idea of reinstating the old Europe-South Africa liner service, but a lack of support and a weak South African rand meant that both these attempts were unsuccessful and the two ships became fixtures in the German cruise trade instead, at least until now. 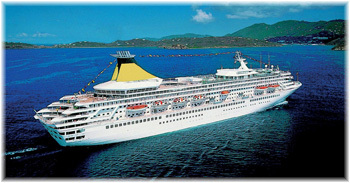 Meanwhile, with Peter Deilmann also in administration while its own river fleet is sold off, plans to retain the 548-berth ocean cruise ship Deutschland in operation in 2010, this will mean three one-ship cruise operators in the German market next year, the third being Lord Nelson Cruises, who intend to operate the 744-berth Mona Lisa. (which this winter will act as an accommodation ship for the Vancouver Winter Olympics). This summer, the 556-berth Athena has been working for Phoenix Reisen as a stand-in for the 508-berth Alexander von Humboldt, a Club Cruise-owned ship that has been idled by their demise. As Phoenix hopes to have the Alexander von Humboldt back for 2010, last week saw the announcement that the Athena would operate in 2010 for Page & Moy as a replacement for the 535-berth Ocean Majesty. This winter, the Athena will be following her usual course, first established by fleetmate Funchal, of sailing out from Piraeus to Fremantle in November for a season of Australian summer cruising and then back next March from Fremantle to Nice. These voyages are booked as line voyages and are well-priced when compared to the world cruisers that leave in the first week of January. The Athena will go down particularly well in the UK market as the Brits like their baths and the Athena has a bath in every stateroom. Her first season with Page & Moy will total only 44 nights, however, 13 nights in May, from Harwich to the Baltic, and the balance in August southwards to Madeira, the Canaries, North Africa and Iberia and back to Dover. With a passenger space ratio of almost 29 tons per passenger, the Athena will be a great improvement on the high-density Ocean Majesty, which offered only 19 tons per passenger. Having been built as Swedish American Line's Stockholm in 1948, she is one of the older ships around, although completely rebuilt in Italy in 1994. Her claim to fame is having been the ship that sank the Andrea Doria when the two ships collided in the approaches to New York in 1953. The 606-berth Amadea, meanwhile, joined the Phoenix Reisen fleet in 2006, having been acquired from NYK, parent company of Crystal Cruises, who had been operatng her in the Japanese market as Asuka (Asuka II is the former Crystal Harmony). Not many outside the German market know much about this ship, but at 29,000 tons, her space ratio is an excellent 48 tons per passenger (Artemis, which carries twice as many, has a PSR of 37, although her capacity could be reduced). Fares for the Amadea include wine with lunch and dinner and she does longer voyages. For example, her world cruise leaving on December 22 is a 147-night affair that sails out through Suez and back through Panama. This Saturday, September 12, she sails from Bremerhaven for Cape Town, a 27-day voyage that is part of a much longer 72-day cruise around Africa that finishes in Hamburg on November 23. 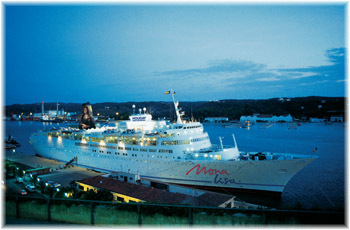 On September 17, 2010, she sails from Bremerhaven on a 41-day Transatlantic circle cruise to Montreal and back to Nice by way of New York, on which the Bremerhaven-Montreal and Montreal-Nice legs can be booked as Transatlantic voyages. Others in the "A" ship category include the Arcadia, Amsterdam, Aquamarine and Aurora, but luckily the clumsily-named Adonia became a thing of the past when she reverted to the name Sea Princess.